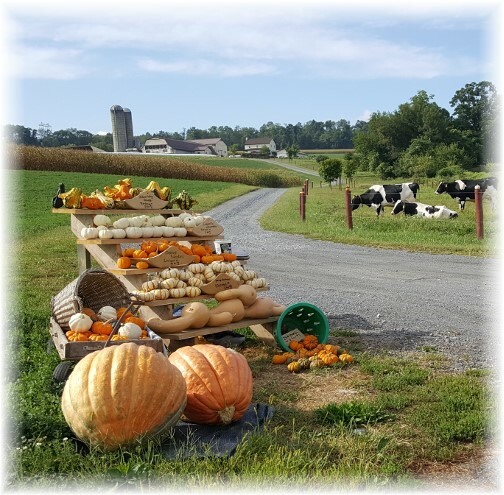 Yesterday on our way home from a chaplain visit we passed this small farmstand on Harvest Road north of Mount Joy. Message Summary: Amazing grace transforms the vilest offender to one pardoned and restored. Our daily verse presents an interesting and often overlooked Biblical truth. "Grace is shown to the wicked." The grace of the almighty God of the universe is abundantly demonstrated in His loving care to our world, even to the most vile. Theologically speaking this is referred to as "common grace." This demonstration of common grace goes on moment by moment in a multitude of ways to all, even the vilest offender; the air we breathe, the livable climatic conditions, food and water. Even the most ardent unbeliever and professed atheist is a recipient of this grace, however stridently he may deny it. Consider what this world would look like in the next 30 seconds if God removed all the oxygen from the air! Jesus expresses this concept of common grace when He told His listeners that God "causes His sun to rise on the evil and the good, and sends rain on the righteous and the unrighteous" (Matthew 5:45). Special grace, on the other hand, is the grace by which God redeems, sanctifies, and glorifies Himself through His people. This special demonstration of grace is extended to us through Jesus for our eternal salvation: "For you know the grace of our Lord Jesus Christ, that though He was rich, yet for your sakes He became poor, so that you through His poverty might become rich" (2 Corinthians 8:9). This grace is available exclusively for those who earnestly believe in Jesus and accept His gift of salvation. This gift of grace far exceeds the worth of all other gifts given to us by God! It has eternal ramifications. Unbelief and ingratitude have blinded many to this marvelous grace so that the vast majority of the world's peoples "do not learn righteousness" which is evident in those walking in His grace. In our New Testament understanding they reject God's grace through Jesus Christ. "They go on doing evil and regard not the majesty of the Lord." Is this not a picture of so many? How do we, as God's chosen people, regard the grace of God today? The Scriptures state, "The grace of God that brings salvation has appeared to all men. It teaches us to say “No” to ungodliness and worldly passions, and to live self-controlled, upright and godly lives in this present age, while we wait for the blessed hope—the glorious appearing of our great God and Savior, Jesus Christ, who gave Himself for us to redeem us from all wickedness and to purify for Himself a people that are His very own, eager to do what is good" (Titus 2:11-14). That is the nature of the amazing grace; transformation from the vilest offender to one pardoned and restored. * Let us thank God for His amazing grace and never cease to be amazed by it. * Let us "learn righteousness" and live our life in a manner that pleases Him. * Let us regard the majesty of the Lord and reverently declare His praises daily. Daily prayer: Father, Your abundant grace is poured out on humankind like showers of blessings, both for believer and unbeliever alike. Yet it is only as we appropriate Your saving grace that we turn away from evil and walk in the ways of righteousness. Many leaders and rulers have come and gone, but You, Father, are the eternal One whose kingdom knows no end. We humble ourselves in the light of Your majesty as we bring honor to Your holy name and live as a people who are eager to do what is good. Amen.